On Wednesday and Thursday, this week, Coco received her last two shots of her heart worm treatment. The shot itself did not take long to give, but the prep included shaving a bit of her fur. As I have plenty of beard left, I have told Coco that I will donate part of my beard, in case her fur doesn't grow back. The ride from Fort Worth (where her Vet is) to home was uneventful. We were a bit nervous on both the days as these shots are serious stuff. Luckily all went well at the clinic. Coco was nervous too, as it is her nature still. But, she was a great patient and cooperated with us and the doctor and techs. Coco will not be permitted to exert herself too much for the next 30 days. After that she should be able to go on longer walks and such. Coco will be retested in February 2019 to make sure there are not any more worms. Looking forward to our fur baby being heartworm free. We are HERE, NOW and that's just perfect. Coco is reacting well to her heartwarming treatment. We still have a ways to go, but staying positive. I will leave you with a song by Ms. Aretha Franklin. RIP, Aretha. On Saturday, May 26, 2018, around 8:30, per a previously scheduled appointment, I took my daughter Chaka to City Vet for grooming. 20 minutes, until they opened the doors around 9 AM. 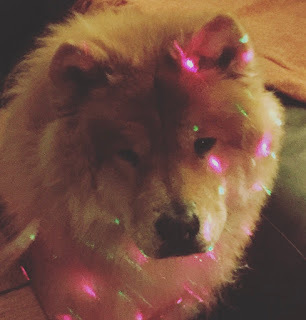 grooming Chows and that she can handle Chaka fine. Strip Mall. I was at Starbucks for about 30 minutes and since I did not get a phone call from the groomers, I was happy to take my wife some breakfast home. So, I went home. call my home number, I did not pick-up. However, my wife realized the call was from the groomer and played the voice message for me immediately. The message is still on our Answering Machine. proceed Chaka grooming further, when they were having trouble in the first place, I immediately called City Vet to let them know I was on my way to get Chaka. At that point, the Manager of the Grooming Department, Anne, came on the line and said, "I am so sorry, but there has been an accident". I was thinking that Chaka tore her dew claw again. But, to my dismay, Anne said, "We are so sorry. Your dog is dead. We tried to save her, but could not". was asked to wait in a room to see Anne, the Grooming Manager. Anne told me that they put 2 or 3 muzzles on Chaka and 2 or 3 groomers, including Anne, had to hold Chaka, for she wasn't having it. Anne said, "Chaka barrel rolled". We have not heard the English(?) term, 'barrel rolled', but presumed it meant Chaka tried to flip about to get away from the tub of water she was forced into. Our belief is that they groomers wanted to make sure they get their $80, put many muzzles on Chaka and forced Chaka against her will into the tub, where Chaka drowned to her death in agony. This terrible act of City Vet, which caused Chaka's death, is tantamount to Animal Abuse / Murder of an innocent animal. Chaka, mind you, was a very healthy girl and she had at least another 8 years of life ahead of her. signs of fear and resisted the grooming/bath. suffered enough by that point in time. Knowing Chaka's story, will you want to go to City Vet for Grooming or other services? Please share with pet lovers everywhere. Thank you! 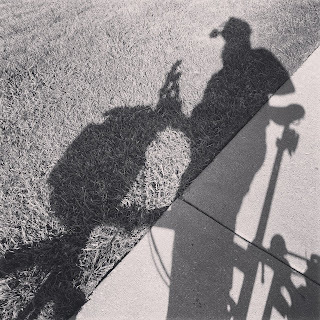 Some shadows around the bike. Linking with Shadow Shot Sunday 2 and Saturday's Critters.